The iPad, when it was released, had no built in functionality for printing. But the newer versions, and, of course, the iPad 2 (Apple’s flagship product), have a wireless printing functionality called AirPrint. 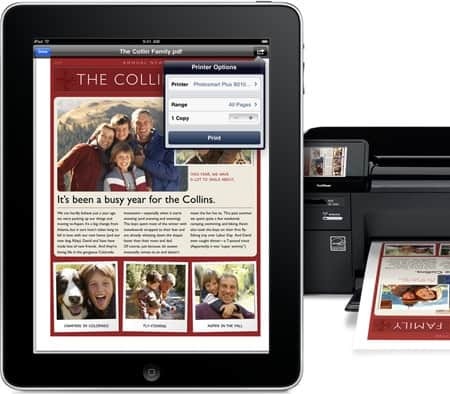 The AirPrint feature comes built into the OS on the iPad and the iPad 2 (the iPad must be running iOS 4.2+). All you have to do is print any document, photo or webpage you want by tapping the print option on your iPad. The AirPrint will send a wireless signal to a printer and the printer will begin to print. This way, your printouts will be ready within seconds. As of now, the AirPrint option is compatible only with some printers (most of them manufactured by HP and Canon). Also, the application you are running must support AirPrint for you to be able to print that application’s data. Many applications, like the iWork apps and third-party applications like Calculated HD are being updated to support the AirPrint feature. The iPad must be connected to a wireless network, which in turn connects to the printer. HP is also beginning to offer firmware updates on some of its older models to enable them to connect to the AirPrint feature, so check before you buy a new printer. Most major manufacturers are expected to produce AirPrint compatible printers in the future. If you are not sure which particular manufacturer to use and are also looking for a discount, you can get a clue at my coupon blog sharing discount coupons such as 4inkjets promotional codes and 123inkjets discount codes. You first need to connect your iPad to a wireless network. Now you need to tap the Sharing menu icon features like Mail, the Safari browser or Photos. You will see a new option called Print. You just need to tap this option and a Printer Options menu will open up, allowing you to choose your printer and letting you decide the number of copies you wish to print. Third party apps might place the Print option in a different location. READ Can't Find App Icon on iPad - How to Fix this? You will have to search for a printer the first the time you are running AirPrint. Tap the Select Printer option, which enables the AirPrint program to scan the area for a printer. Once it finds a printer, select it and tap print. The next time you need to access this printer, its name will be stored, making it even easier to access. You can keep a tab on pending print work and cancel print jobs. You will also receive a notification when the printer needs refilling. They have also added a Print Center icon on the iPad’s multitasking bar. The Print Center button lets you access a Print Order pop up window that shows any print jobs you have pending in your queue. You can access a full summary of any print work- you can see the document name, the destination printer, number of copies to be printed and additional details like whether the print outs are to be double or single sided. It also shows you an estimated print time and status. A big red Cancel Printing button lets you stop a print job. The AirPrint feature lets you print your documents smoothly, easily and wirelessly- it will surely save you a lot of time and effort. Costea writes about 123inkjets discount codes and 4inkjets promotional codes. These 123inkjets discount codes and 4inkjets promotional codes can help you save on printer inks.